In the Spring of 2009, at the invitation of Fowler Jones, Ph.D, Greg and I headed out on a road trip to Kansas City to give a talk on intuition at the Psychic Studies Institute. On the way there, we took a detour to Springfield, Missouri, to visit an old friend, Norm Shealy, MD, PhD. We took these photos of his inventions at his farm. For those of you who don’t know, Norm is the founding president of the American Holistic Medical Association, the founder of Holos University Graduate Seminary, author of Energy Medicine (and 30 other books including my favorite, the classic, 90 Days to Self-Health). Norm is a pioneer and expert in pain management. For his inventions, he holds 14 US patents in the field of medical science. He will tell you that every one of his creative ideas came to him from his guides. For this newsletter, we interviewed him on the ways he accesses intuition for both healing and creativity. “In the early years of my life, answers just came to me. I knew things. In school I knew the answers to questions without having to figure them out. I know I was accessing my own wisdom. Later, I knew things beyond any schooling or training. I was not only accessing my own wisdom, but I was also accessing my guides for information. 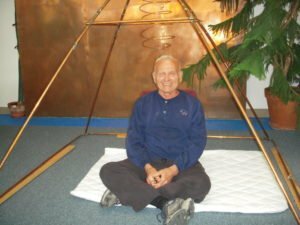 Norm Shealy enjoying the copper pyramid he created. As far as I can tell, I am just a receptacle of information from this, and possibly other, teachers. I get an idea, an image, a thought, an understanding, and I have been told that these are messages from my guide teacher. 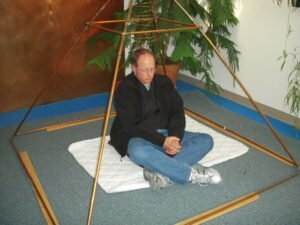 Greg Meyerhoff meditating in Norm Shealy’s powerful copper pyramid. Here is another example of accessing information that I did not have from this current life. In 1966, I started putting needles into patients’ pain and hooking up an electrical stimulator to stimulate those points. I would just say to my patients that I was doing a little Chinese acupuncture. Then, when the first Chinese medical delegation came to the US, they came to visit me because they, too, had begun to use the electrical stimulation of needles the same year that I had. They had not done that before. I have to assume that the knowledge of acupuncture had come to me from a previous life in which I had done acupuncture. A lot of things come to us from past lives. 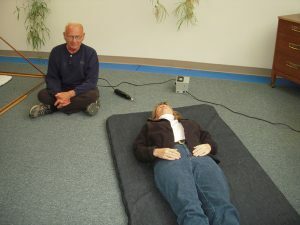 Other times the information just comes, through intuition, such as the idea to use electrical stimulation. 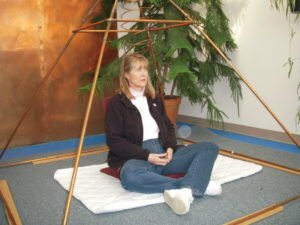 Anne Salisbury sitting in Norm Shealy’s copper pyramid with a spirit orb of light at her side. Norm explains about his amazing healing oils and gives his daily routine for being more intuitive and connected to guides download the full hour audio. http://www.NormShealy.com. Sign up for his free, extremely informative newsletter!